In 2003 I received a nice little bonus. I looked at it and immediately thought - "Wow, where should I go?" God forbid I actually put into a savings account. Nope! The travel bug was biting. Unattached at the time I grabbed my very lucky mother and off we went to spend an entire week in Florence. I had always wanted to visit Florence; the art, shopping and biking through Tuscany. All of it seemed so perfect. Well, our plans certainly changed once we landed - in the middle of a record breaking European heat wave. It was the hottest summer on record since 1540. Regardless of the seriously thick air we were breathing, apartment I rented without air conditioning, gelato literally running out of the cone and down our arms before we even had a chance to get at it, not seeing Michelangelo's David because it was too hot to walk there, the dead and dry Boboli gardens, we had the most amazing time. We lived off of peaches and water the entire week. I am not kidding. We barely touched the pasta. It was just too hot to eat. Thinking back I cannot think of one other travel companion who could have endured this trip other than my mother. What a trooper she was. So Mom, this website is dedicated to you. Seven years later I returned with my mother. This time my sister and niece joined us. The weather was ideal, the gardens were gorgeous – Florence was in its prime. I hope my stories and suggestions help you in making Florence a trip of a life time. 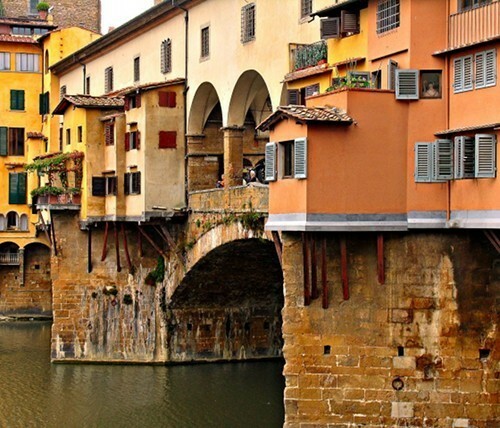 The colours of this website were inspired by the Ponte Vecchio - a favourite Florence landmark.